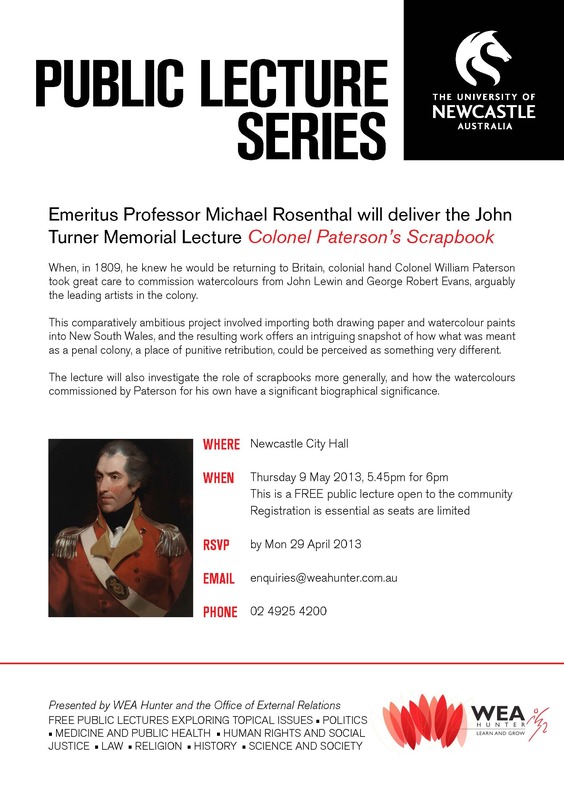 Emeritus Professor Michael Rosenthal will deliver the John Turner Memorial Lecture Colonel Paterson’s Scrapbook. “When, in 1809, he knew he would be returning to Britain, colonial hand Colonel William Paterson took great care to commission watercolours from John Lewin and George Robert Evans, arguably the leading artists in the colony. This comparatively ambitious project involved importing both drawing paper and watercolour paints into New South Wales, and the resulting work offers an intriguing snapshot of how what was meant as a penal colony, a place of punitive retribution, could be perceived as something very different. Michael Rosenthal BA, PhD (London), MA (Cantab) studied at the Courtauld Institute, and was Leverhulme Research Fellow at Jesus College, Cambridge, before arriving at Warwick, where he has remained for 35 years. He has held various fellowships in Australia and the US, and was lead curator of the Gainsborough exhibition at Tate Britain in 2002. Michael Rosenthal is currently undertaking research towards a second book on colonial Australia titled Governor Macquarie’s Culture.